Sometimes it can be a little difficult to get a grasp on just how big some things are. Take ships for example! During World War II the ocean was packed with vessels that kept vital lines of trade open between the Allies, and some of these were vast in size and weight. Warlord Games have just released their naval combat game Cruel Seas and while this game features finely detailed miniatures, it is in a smaller scale than normal coming in at 1/300th scale or 6mm! This means that though the ships for the game are about an inch or so in length, vessels such as Warships and Battleships would be huge in comparison. Enter the Merchant Tanker for Cruel Seas! This is a much larger sized vessel though of the same scale and an ideal addition to the game. If it wasn’t for merchant vessels delivering much needed supplies, the outcome of the war could have been very different. 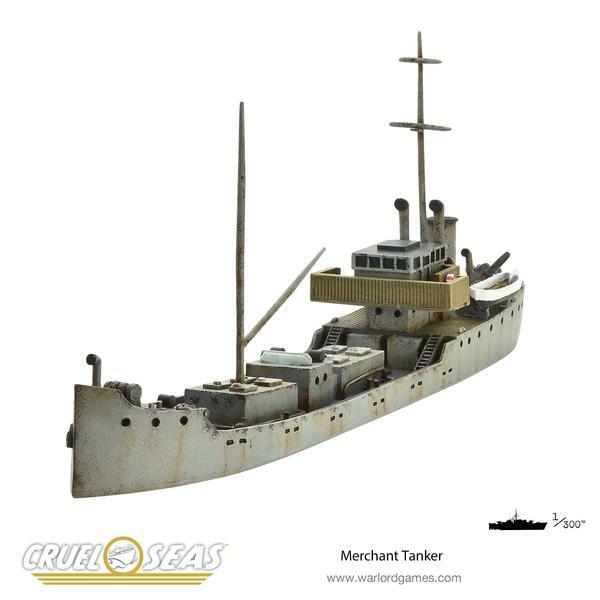 The Merchant Tanker and Cruel Seas are available now direct from Warlord Games and all good stockist everywhere!